Wolfgang Penetsdorfer, the organizer of the Game of Thrones tourney, invited me as artist guest of honor to castle Stahleck. 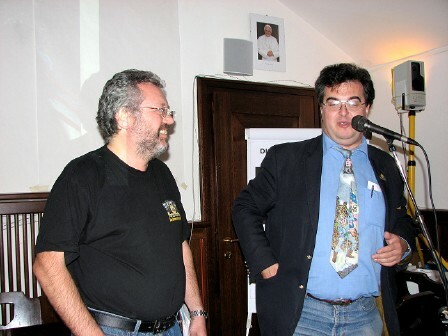 Wolfgang Zenker introducing me at my presentation of "30 years of Science Fiction and Fantasy art" and the slide show "Space Rebels and Explorers"
Natürlich zeichnet und signiert er auch für seine Fans ganztägig. 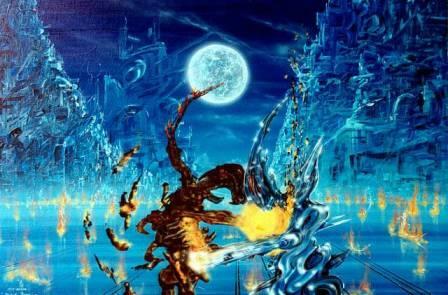 During the Vienna based Spielefest in the Austria Center in November one of my paintings has been stolen in the night. If you see the original work of art please inform me immediately. ( A high visit during the tradtional Fantasy Convention in Vienna. As usual we had big fun and nice fights. 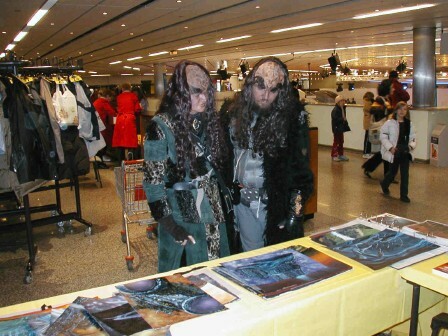 As usual the Klingons won. 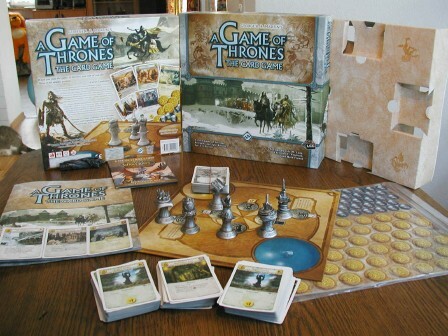 I was nominated for the Griffin Scroll Award by the Wiener Spieleakademie in 2006. 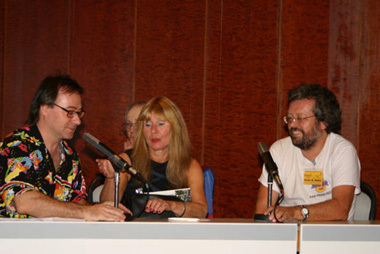 I visited the Worldcon in Glasgow 2005 where I met George R. R. Martin. Photos you can find in the gallery at The Whole Austrian Fandom. 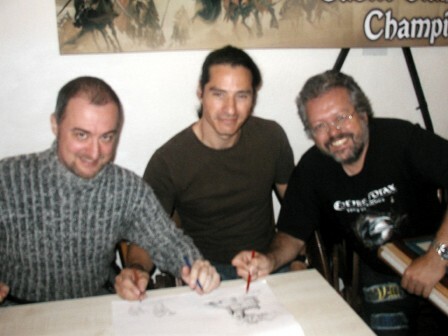 I was Artist Guest of Honor at the PalatineCon 2004 in Germany, where I showed my work, held a slideshow and was present at panels during the convention. 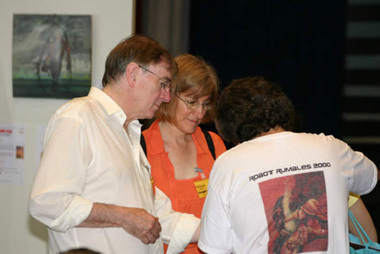 Leigh Kennedy and Christopher Priest visiting me at my artshow at the PalatineCon. They are really charming people. 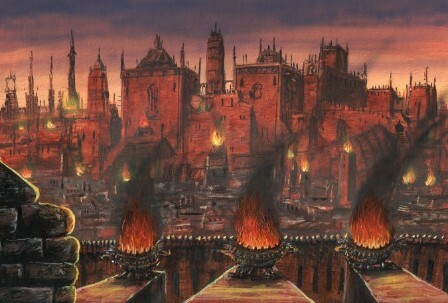 At a panel about my SF and Fantasy paintings we had great fun. At the back you can catch a glimpse of world famous Waldemar Kumming. I was interviewed by Wolfgang Glass and Usch Kiausch translated for the English guests. 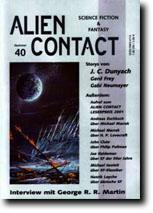 Portfolio for Indian Magazine "Livepostive Plus"
A portfolio of my art was published in this magazine with the title "Visions of Tomorrow - the future of humanity"
Coverart for German Magazine "Alien Contact"
Artwork: "Master of the Negasphere". 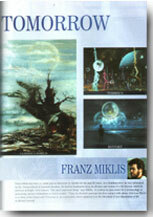 Magazine of Germany, and I`m quite happy that its editors, Hardy Kettlitz and Gerd Frey, are big fans of my art. 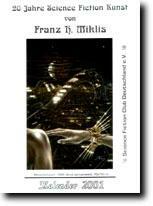 This is the title of this years calender, produced by Europes most important SF Club, the Science Fiction Club Germany. The club was founded in the fifties and has more than 500 members. Title of the artwork: Menschenhauch 2. 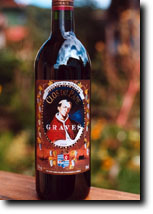 "Garden of the Pope" is the translation of "Clos du Pape". This is the title of a new grand wine of Bordeaux. The etiquette was designed by me and is a variation of a wall painting I´ve painted some years ago on the wall of a winery in La Brede (Bordeaux) where pope Clemes V lived back in the 14th century. It was a big fun working in France and living in a grand old house, maybe sleeping even in the bed where a pope had slept. (The wall painting is quite popular in this region and saw positive critics in French newspapers and on tv).